The Ministry of Public Security held a press conference in Vientiane on Friday to report on the progress of police investigations into the disappearance of Mr Sombath Somphone. The Deputy Director General of the ministry’s General Police Department, Colonel Dr Phengsavanh Tiphavongxay, gave the third briefing on police efforts to locate Mr Sombath since he was declared missing on December 15 last year, and the following is the full text of the briefing, exactly as received by Lao media. Third briefing on the results of police investigations to locate the whereabouts of Mr Sombath Somphone. 1. We have coordinated and worked with Xamket village authorities of Sikhottabong district, and Xanghuabor village authorities of Xaythany district in Vientiane to collect information on the involvement of the missing person with the Soun Panya Nivet (Ecosystem Knowledge Centre) and Soun Hienhou Suanmai Lao (Lao Horticulture Learning Centre). In addition to this we have also continued to collect information at Nakham village, Sikhottabong district and Khoknin village, Sisattanak district and at some other locations to be used as references for our search operation. 2. We further coordinated, examined and assigned all the concerned technical police nation-wide to continue to follow up and search for relevant information and sources that may be useful for our search operation. 3. The Lao International Police Department has sent a request letter to INTERPOL to issue a yellow notice on Mr Sombath Somphone as a missing person and INTERPOL has issued the yellow notice on Mr Sombath Somphone as a missing person on April 23, 2013 and published it in the media, including on the internet. • Japan, India and France requested necessary information such as: Passport Number and a copy of the ID card of Mr Sombath Somphone which will be used as a reference for their officers to search for him and the Lao International Police Department has already provided the required information to the requesting countries. • The Republic of Korea informed that on November 9, 2012, Mr Sombath Somphone departed the Republic of Korea for Thailand. • The United States of America also informed that it has registered the missing person on the monitoring list of the US immigration since it received the letter. • Spain, on its part, informed that it did not find any relevant information as requested. 5. On April 24, 2013 we invited Ms Ng Shui Ming, who first notified us that Mr Sombath Somphone was missing, to come to the police office so we could inform her of the results of our investigations and ask her to continue collecting further information. Apart from this, the committee has also met and clarified this case with interested persons and representatives of the foreign diplomatic missions to the Lao PDR. All of this has demonstrated the high sense of responsibility of the leadership of the Ministry of Public Security, as well as the General Police Department in supervising the committee in charge of the investigations to locate the whereabouts of Mr Sombath Somphone, in order for the committee to perform its duties regularly in accordance with the required investigative techniques and law of the Lao PDR. 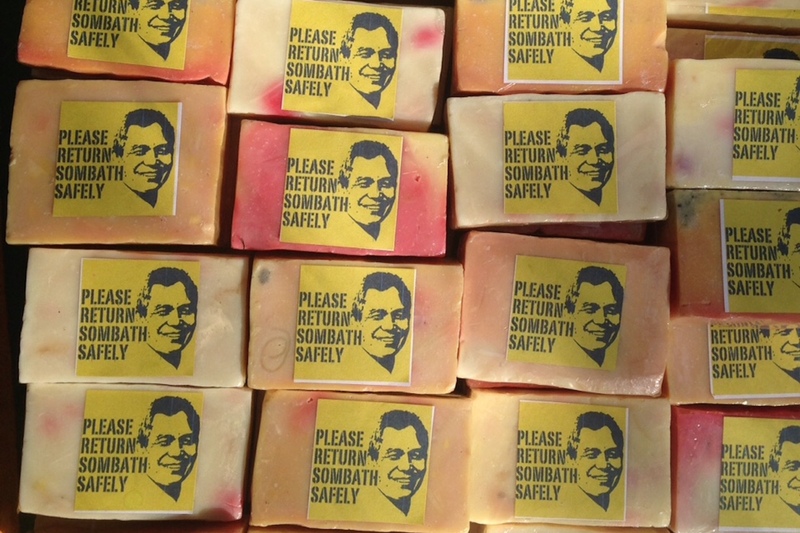 Up until now, Mr Sombath Somphone has not yet been found. The committee in charge of the case will continue to investigate and collect information, check and verify the information sources and collect information from individuals and organisations from within the country and abroad in accordance with its mandates and duties. Therefore, I would like to brief all sectors, organisations in the country and abroad on the results of the investigation. Any individuals or organisations that may have any information related to the case are requested to report that information to the Vientiane, district or provincial police authorities nation-wide so that they can play a part in solving this case.